Share Your Math With The World For Free! In the beginning, about 1985, there was Expressionist - an equation editor that made a huge splash on the Macintosh market for making beautiful equations for the new Macs and their hot LaserWriters with PostScript, produced by Prescience Corporation of San Francisco, lead by master programmer and architect Allan Bonadio. Expressionist was very popular, especially with its EGO = Editable Graphical Object protocol, which was the predecessor to Microsoft's OLE - Object Linking and Embedding. About 1998 Expressionist was expanded to Theorist, moving from just being an equation editor for printed documents, and into the realm of computer algebra and graphing systems, competing with the new Mathematica, Maple, MathLab, MathCad. Theorist was rather amazing for its graphics and computational power on Mac OS6 Classic and machines like the old SE/30 Macs. Around 1992 Expressionist and Theorist were sold to Waterloo Maple of Ontario, Canada. A few new product names appeared: μExpressionist, MathPlus, MathView (direct descendant of Theorist), and then the coveted TheoPro, which had a back-engine link to the Maple computational engine. During this time, MathView Plug-In appeared in 1994, a Netscape-browser plug-in to embed MathView notebooks inside of webpages and retain its interactive functionally - amazing and well before things like Flash were popular. In 1999, the Expressionist and MathView products were sold to MathMonkeys,LLC of Cambridge, Massachusetts, lead by long-time Theorist user and developer Robert Curtis. The old Prescience team was reassembled for a few years to move the products into new versions. 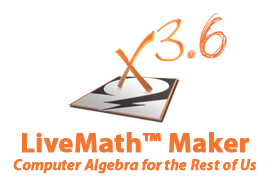 The products took another name change, with Theorist being switched to LiveMath, to allow for four products: LiveMath Maker, LiveMath Plug-In, LiveMath ActiveX, and LiveMath Viewer. Expressionist was changed to MathEQ. LiveMath moved into the engine that drove the Distance Calculus online educational system, offering academic credit courses over the internet, before online education was a common offering in higher education. 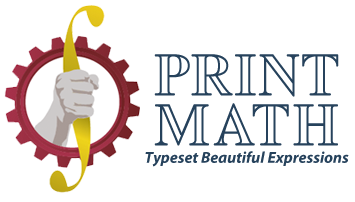 Now we fast-forward to 2019 with our current product line-up: LiveMath Maker, LiveMath Viewer, and PrintMath (the new name for the older Expressionist original program). 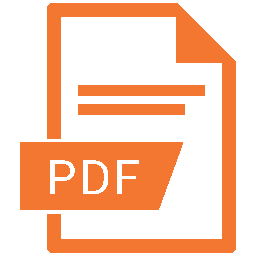 On the Mac side we are working on the products moving to the newer Cocoa/Swift foundations for truly modern and powerful graphics in the guise of LiveMath 4.0 and PrintMath 5.0. An iPad version of LiveMath is also under development.